If you want fresh foods on your table, open your own grocery store. That is what happened in Franklinton, Ohio, on the West side of Columbus, in a community that struggled as a food desert until Lower Lights Christian Health Center opened the Jubilee Market and Cafe. The health center started the nonprofit grocery store in a renovated candy factory earlier this month. Now low income residents can get discounts on fresh fruits and vegetables, commodities that were hard to come by in the neighborhood that has been lacking a grocery store for years. “Having access to affordable, nutritious food is a key component of a healthy lifestyle and preventing and treating many chronic conditions, such as diabetes and heart disease,” said Tracy Cloud, Interim CEO of Lower Lights. The Jubilee Market and Cafe is the latest addition to the full family health care services offered at the health center. And it was sorely needed. After other grocers closed up shop, finding affordable fresh produce posed a challenge for residents. Lower Lights tried to attract a grocer to Franklinton without success. Plan B: start one on their own. The health center’s leaders raised private funding and secured the loan to help with the renovation. They also received public support from local government and business officials who saw that the project could attract more development to the area. The grocery store, and its partner, Graze Cafe, have also generated local jobs with hopefully more to come, according to plans. The Jubilee Market and Cafe is part of a broader practice among health centers to address the social determinants of health — nutritious food being an important factor in maintaining good health. There are an abundance of food deserts like Franklinton across the nation . Food deserts are areas without grocery stores. They usually happen in economically challenged neighborhoods where the demographics do not attract grocery store chains. The problem is worsened by a lack of transportation. Over 14 percent of people in the United States (48 million) face food insecurity, or a lack of access to sufficient quantities of nutritious and affordable food. NACHC has completed a project which documents the promising practices of Community Health Centers in addressing food insecurity. For more information about their work please visit this link. 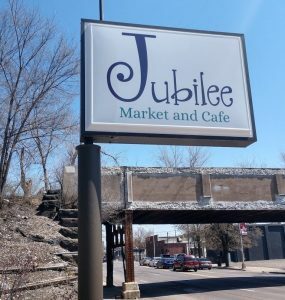 You can also follow the Jubilee Market and Cafe on Facebook, Twitter and Instagram at @JubileeMarketCafe.